On 1 March 2013, the Jurisdictional Blood Committee (JBC) approved the introduction of subcutaneous immunoglobulin (SCIg) under the national blood arrangements through an assurance framework for the appropriate use of the product. Participation in the SCIg program requires hospitals to establish their capability and capacity to manage a hospital based SCIg program within the governing requirements described below, and requires endorsement by state health departments in some states. A list of participating hospitals and their contact details is available on this web page. 3. following a patient-specific SCIg request submitted in BloodSTAR. The NBA has arrangements in place for the supply of SCIg products. There are both domestic and imported SCIg products available. Orders for SCIg are made through BloodNet. In seeking authorisation, the requesting medical officer will be asked to provide information to the Blood Service through BloodSTAR to establish that the request meets the Criteria. Access to BloodSTAR is only available through the BloodPortal. To register an individual account follow the process outlined in the instructions and tip sheets available here. BloodSTAR has been designed to implement best practice privacy controls and is fully compliant with the Privacy Act 1988 (Cwlth). For more information about the privacy controls in BloodSTAR, visit the BloodSTAR Privacy Controls page. 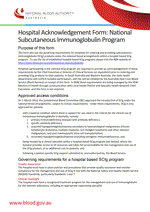 Hospitals participating in the national SCIg programs are required to provide an acknowledgement of the governing requirements by the Chief Executive or Director of Clinical Services (or equivalent) prior to ordering and providing SCIg products to their patients, using the following form. 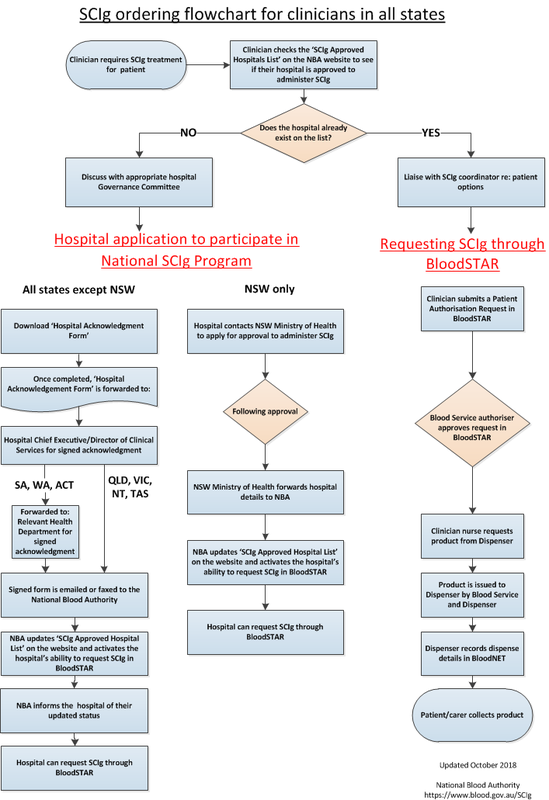 In all states except NSW, hospitals participating in the program are required to provide an acknowledgement of the governing requirements by the Chief Executive or Director of Clinical Services (or equivalent) and forward this form to the National Blood Authority via fax or email (please see contact details below). In South Australia and Western Australia, hospitals participating in the program also require endorsement from their State Health Department. In NSW these requirements are being managed by the NSW Ministry of Health through communication with Local Health District and Specialty Health Network Chief Executives, and this form is not required. For information on NSW arrangements contact Dr Marianne Gale, Medical Adviser, Office of the Chief Health Officer via email at MGALE@doh.health.nsw.gov.au. A number of hospitals across all states and territories are participating in the National SCIg Program. To view the current list, please click on the image below. 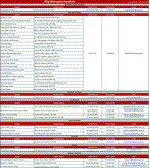 The following materials are provided to assist hospital based SCIg programs. 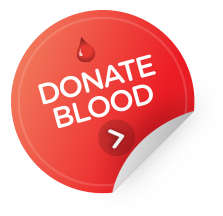 For further information please contact the National Blood Authority on 13 000 IG GOV (13 000 44 468) or email IgGovernance@blood.gov.au.